West African rice production technology—developed by farmers in the Upper Guinea Coast more than five hundred years before the trans-Atlantic slave trade—laid the foundation for South Carolina and Georgia’s commercial rice industry. The agricultural skill, ingenuity, and technology of enslaved Africans made coastal South Carolina rice planters the richest planters with the largest slave holdings in the antebellum U.S. South. The floods fertilizing the inland and tidal rice fields also created the most deadly living environments for enslaved laborers in the U.S. South. Tens of thousands of enslaved men, women, and especially children perished in the stagnant, cold, mosquito- and disease-infested swamps. Along the Savannah River, approximately two-thirds of children born on rice plantations died before they reached age 15, 40 percent in their first year up until the Civil War. Historians have no way of counting the stillbirths and miscarriages among enslaved women. Our ancestors lost their youth, health, lives, and children as a result of reshaping the coastal landscape, carving rice fields out of cypress swamps, building earthen embankments “nearly three times the volume of Cheops, the world’s largest pyramid,” and engineering a hydraulic irrigation system. Yet, there are no memorials to commemorate their appalling sufferings, involuntary sacrifices, or immeasurable contributions. A true marriage between West African and European classical traditions, Casop: A Requiem for Rice is composed for full symphony orchestra and choir, an African and African-American inspired take on a classic requiem. Casop draws on funerary traditions among the Diola-Fogny to recount the stories of enslaved laborers building Lowcountry rice fields. 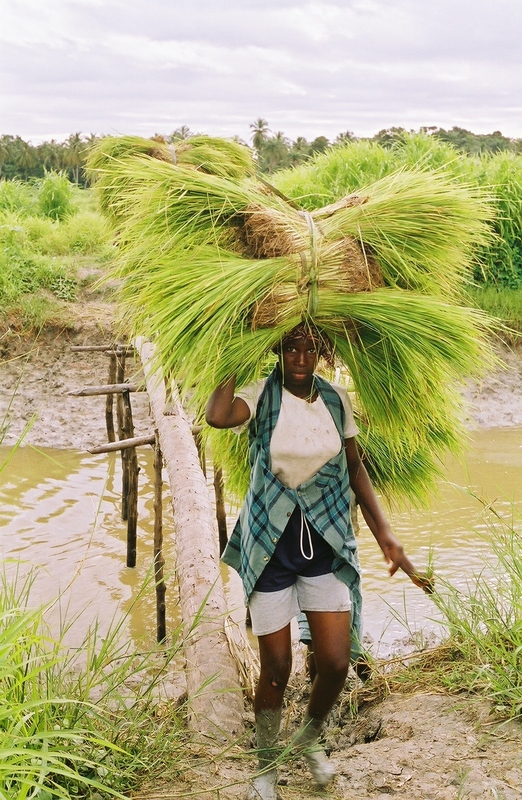 The Diola are quintessential rice farmers along the Casamance River of present-day Senegal. In the event of untimely, accidental, and suspicious deaths, Diola-Fogny ritual specialists performed casop, a “ritual interrogation of the corpse” via spirit possession. During the funeral, the deceased was asked to tell his or her story about the circumstances of death. Once the truth was revealed, the dead would be buried and harmony and peace restored to the community. Casop is simultaneously a modern take on a classic European requiem—in the spirit of Verdi, Mozart, Faure, and Britten—that mourns the souls of the enslaved who died on Lowcountry rice plantations, their bodies unburied, their suffering unmourned, and their sacrifices unmarked for future generations. The lamentation turns to celebration of the critical role enslaved Africans’ ingenuity, technology, and industry played in the economy of the US South, laying to rest once and for all, the shackles of shame, blame, guilt, and denial that pervade this painful period in European, American, African, and African-American history. Casop reclaims African and African-American history and fosters reconciliation among Africans, Europeans, and Americans. The stories of Africans enslaved on Lowcountry rice plantations become a new genre, the vehicle through which oppressed and voiceless peoples can tell their stories, mourn their dead, and celebrate their contributions to the world. Carnegie Mellon's Center for the Arts in Society selected Requiem for Rice as its Performance Initiative for 2015-2017. Portions of Casop will be staged in Pittsburgh February 22, 2018 (as part of the Pittsburgh Humanities Festival) and Fall 2018 (date to be announced). The full piece will premiere February 13, 2019 in Pittsburgh at the Carnegie Music Hall Oakland performed by the Colour of Music Festival Orchestra. Now in its fifth year, the Colour of Music Festival offers a musical kaleidoscope highlighting the impact and historical significance of black classical composers and performers on American and world culture. The annual Colour of Music Festival takes place at various venues throughout historic Charleston, South Carolina. Assembling acclaimed black chamber ensemble players and artists to form the Colour of Music Orchestra, the five-day Festival showcases some of the top black classical musicians in the United States, trained at some of the most prestigious music schools, conservatories and universities in the world.